I love the cilantro-lime rice from Chipotle, but when I'm trying to cut down on rice and pasta, I need a replacement. For the longest time I've been adding grated and steamed cauliflower to my rice to save calories. But replacing all the rice is new to me. You can make cauliflower rice in a lot of ways. You can steep the grated cauliflower in boiling water for a minute, and then drain it. Or nuke it in the microwave for 30 seconds. Or fry the cauliflower up in a skillet. The latter is what I did in this recipe. 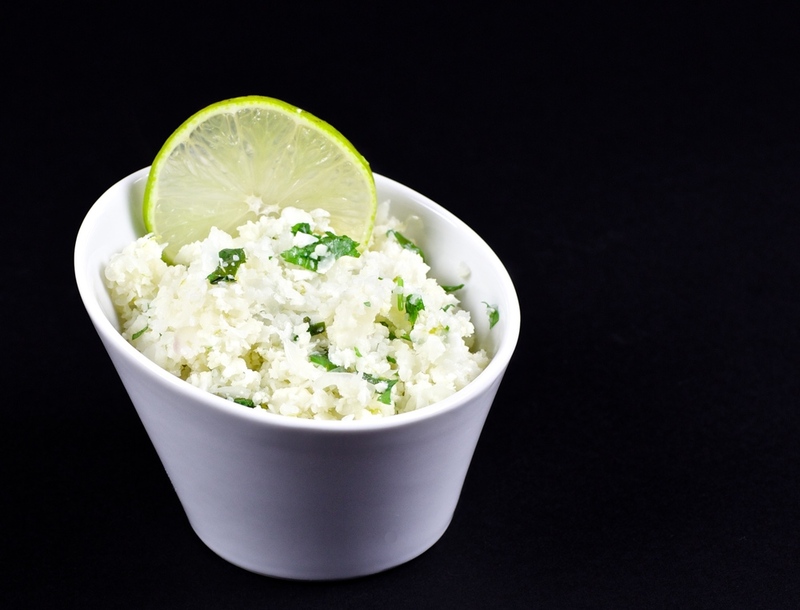 Grate the cauliflower or using a food-processor pulse until cauliflower is rice-sized. Mince garlic, chop shallot. Heat a skillet or sauté pan over medium heat, add oil, shallots and garlic. Sauté until tender. Raise the heat to medium-high. Add the cauliflover and sauté while stirring until it's tender, but still have some bite. Season with salt. Remove from heat, add cilantro, lime zest and juice. Serve immediately. Riv blomkålen, enten på et rivejern eller i en food processor, så blomkålen er på størrelse med riskorn. Hak løg og hvidløg. Sæt en pande over medium varme. Kom olie, løg og hvidløg i panden, og sautér indtil løgene er gennemsigtige. Skru op for varmen og kom blomkålen i. Steg indtil blomkålen er mør, men der stadig er bid i. Smag til med salt. Tag blomkålen af varmen og tilsæt koriander, limesaft og -skal.